Knows how to take teasings -quick smile - one of the Four Musketeers - quiet but friendly - sweet and kind. "Hombre Listo" - innocent face but always ready with his dedense - wills his smile. Negative pole when the positive pole is mathematics - wants to graduate in languages - wills his knowledge of world affairs -slow to speak but sure when started. "Mr. Activity" - nuclear engineer - wills his "conocimientos destructores" - able to find a debate in anything - child expert since Field Day. "Wide-eyed Wonder" - good friend and loyal companion - talent for writing - active extra-curricular activities. wills her "Mona Lisa smile". Student Council President - likes to tease - loyal friend - owner of the Hangout - future electronic engineer. Pepe - popular he says with girls - hotel administration -wills his broad smile and songs -always ready to lend a hand. Tommy - artist of the Fourth Year- lends his artistic talent to all activities - good friend with a happy disposition - wills his aplomb to speak in front of the class. Always laughing - famous for punctuality in schoolwork - obliging and courteous - wills her even disposition. Outstanding student - always' with Evelyn - very understanding - wills her ability to make friendships. Outstanding Hija de María. Popular for her singing - wants to be an airline hostess - wills her hairdos. Dreamer - quietly cooperative -wills her likeness to Marta Romero. Commercial Club. Talent for commercial subjects -bookworm - President of Commercial Club. "La Melena" - distracted genius - loves a good discussion - stands by her decisions. "Chiqui" - Class President - apt for speechmaking- likes commercial work - wills the crease in his uniform. "Nuestra Gran Dama" - wills her "A" in mathematics - Baby-killer in volleyball - respectful -a favorite among her companions. "Class Poet" - gentleman - wills his place in the gymnasium -ready sense of humor - champion weightlifter. Man of great thoughts and few words - leaving for New York - putstanding in sports -wills his pants and shining smile. Alyn - able to keep a secret -high ideals coupled with the perseverance to attain it wills her reserve. "Bole" - one in whom you can confide - wills his good manners and his "tres amigas" - bowling expert - camera fan. Business administration - well known for his bearing and well-groomed look - "Mr. Guillete of the Year - boxing and bowling. "Miss Hospitality" - wills her refinement - famous for her dance. Nervous energy . quick silver -wills his good looks and personality - Holy Name President -valuable member of Musical Festival. "Perito" in Commercial - faithful typist for Ecos - wills his willingness to be of service. "Anie" - essay contest expert -retiring - uses time well - honor student - enjoys biographies of the saints. Good sense of humor _ honor student - wills her ability to speak English like an "Americana". All-around - popular in the colegio - wills his ability to get along with the other students -captain of the volleyball team-forensic finalist. Studious - math genius - cooperative with her companions - always happy - interested in accounting. Basketball star - chemical engineer - wills his long legs and eye glass case - tease - puzzled look - Mayagüez - bound. Pacón - rival de Molinary - favorite study, math - wills his great love of horses. "Swifty" - always ready to give his opinión - wills his "puntuality" - "paseítos" - happy disposition. "Tito" - Chemical Engineer -contagious l a u g h - wills his "height" and his system of finding the Colegio - destination -Siena College. "Narcisa" - wills her personal neatness and good taste - home permanent expert - violent in discussion but sentimental not withstanding. "Baby of the Fourth Year" - always ready and willing to cooperate - worthy of her teachers and companions' esteem - wills her "pañuelo de puntos rojos". 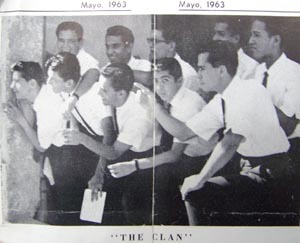 Adrián Delgado, Orlando Díaz, Roberto Cruz, Rafael Menéndez, Félix Jorge Agrait, Luis Ángel Molinary, Jorge Ruisánchez, Peter Berríos. Fotos y documentos, cortesía de Tomás (Tommy) Arroyo.